Comments from the NRHP application, found HERE. The Adams house, built in 1904 by Charles F. Adams and designed by the architectural firm of Whidden and Lewis represented a modified Georgian style. The house is situated on a combined site (190' x 100') with the Bates-Seller house, another Whidden-Lewis designed structure which was declared a National Historic Place in August, 1979. The Bates-Seller house, now also owned by Eugene and Marianne Perrin, is undergoing external preservation and will eventually be converted to apartment use, preserving the magnificent interior. Just to the east of this site stands the Trevett-Nunn house, another Whidden-Lewis designed structure which has been designated a National Historic Place. The Adams house is a two and one-half story adaptation of the Georgian Revival Style. The wide overhangs of the hipped roof are in the Craftsman vein but are nonetheless finished with a classical cornice. Although built as an "L" shaped structure, a series of additions to the rear have left it nearly a 54 x 50 foot rectangle. A hip-roofed portico with an Ionic column screen is centered in the facade. The corners are trimmed with brick quoins. A bay window on the west end of the facade balances a low-walled terrace on the east side. The windows on the second floor and the front dormer are symmetrically placed. The west facade originally was symmetrical, but the library addition, added to the rear in 1918, means that the windows and the dormer now appear to be pushed forward. Very slight variations in the brick color mark the original corner and reveal the symmetrical plan. The rear and east facades are irregularly shaped and show no strong pattern to their fenestration. The house is break-bearing wall construction of flemish bond. The brick of the library and later additions closely matches the original. The joints were beaded when first built, but most of the beading has worn away over time. The roof, removed in the early 1960s, has been replaced. Its hipped design, based on photographs, closely matches the original. An exception is the dormers. These are each two feet wider than the originals, and the windows on the front and east dormers have been doubled. The proportions of the dormers are close to original. The rear portion of the roof, invisible from the street and not seen in any photographs, was rebuilt as a gable. The library wing roof does retain its original hipped shape. Two asymmetrically shaped and located chimneys pierce the roof. These too have been rebuilt. The second floor sleeping porch, originally in the rear, was moved to the east facade when the library was added. It was later changed into a fire escape, and only the wrought iron supports remain . The fire escape will be removed and the supports used to carry a deck. The windows are mostly double-hung. Casement windows appear in the library bay and on the second floor front facade where they are multi-paned with diagonal muntins. No shutters are found on this building. The windows are wood, the sills concrete, and the lintels flat- arched brick. The original interior of the house was heavily detailed. The dining room had a 6 foot paneled wainscoting and a beamed ceiling. The library had paneled wainscoting, built-in book cases, and a wide cornice molding. Little remained intact, but enough was left to determine what was there. All the wood trim, with the exception of the oak stair bannister, is fir throughout. The living room, now the patient's waiting room, retained most of its original detail. The fireplace has an Adamesque mantle with off-white marble surround and hearth. Most of the three-part plaster cornice molding remained, as did the original 6 foot wide door and window trim. The tile hearths in the library (red and green) and the master bedroon (green) remained, as did the mantelpieces. The bannister for the main staircase was about 3/4th intact, with the remainder rearranged. The interior spaces were altered numerous times. Only the front hall and the living room retained their original dimensions and feeling before restoration. Photographs provided by the Adams family of the original Adams residence proved invaluable in planning the restoration process. The roof line was rebuilt along original lines, the brick was carefully cleaned, and the fire escape and other extraneous additions were removed. The ground floor was adapted for professional office space by the owner. The upper two floors contain three apartments. house was fitted with gas-electric lighting capability. A French door was replaced in the front hallway. The location and design was determined with advice and assistance from Mr. Adams' daughter. The crown molding in the hallway was chosen to match that which was existing in the living room. The front stairway was refinished and a portion of the missing railing was reduplicated to match the exisiting. In the living room, the fireplace and mantel was retained. The glass lamp shades are original to the house. The plaster crown molding was damaged in some areas. Replacement was made by casting the component strips in plastic from clay molds. It is once again intact The library area and fireplace mantels on the second floor were stripped of many layers of paint to return them to their previous natural wood finish. features original to the house. other houses, including the neighboring Bates-Seller and Trevett-Nunn Houses, previously entered into the National Register, are finished with weatherboards in the Colonial Revival Style. 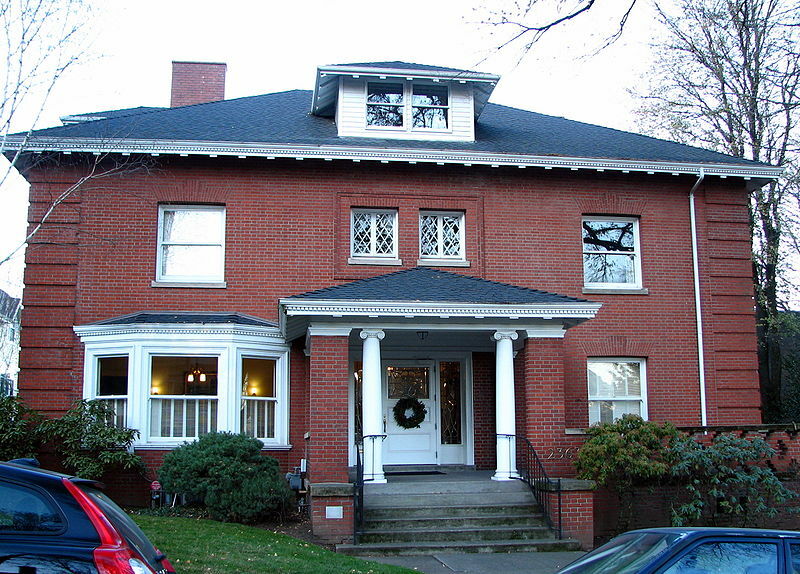 The Adams House is noteworthy as an exceptional example of residential work by the distinguished firm of Whidden and Lewis, which produced Portland's City Hall,, and other city landmarks. However , it is significant primarily for it's association with the client, descendant of the distinguished family which produced the respected namesake, historian Charles Francis Adams. A native of Baltimore, Charles Adams arrived on the Portland scene in 1890 and became influential in banking circles as president of both the Security Savings and Trust Company and the First National Bank of Portland. He is equally remembered as an important Oregon collector of fine art and a longtime patron of the Portland Art Museum. The Adams House underwent minor changes at Adams' direction in 1918, but beginning in 1943, following Adam's demise, the property became a convalescent center, and substantial changes spurred by storm damage were carried out. The property was acquired by the present owners in 1979 and was systematically restored to its original configuration both inside and out for use as a medical office to the benefit of the entire Flanders Street ensemble. In its restored state, the Adams House possesses integrity of location, design, setting, feeling, sufficient materials and workmanship, and association with figures of significance in Portland's financial and cultural affairs. The restoration was guided by good record photographs of interior and exterior and by testimony of the Adamses' son and daughter. Charles Francis Adams, a descendant of the Adams family famous in early American history, was born in Baltimore on March 8, 1862. He was educated as a civil engineer and received his degree from Yale in 1881. He began work as a surveyor on a railroad which was being built west of the Mississippi. In 1883 he was offered a position in a bank at Colfax, Washington, where he remained until 1890, when he came to Portland to aid in the organization of the Security Savings and Trust Company. He became President of this bank, which was later merged with the First National Bank. In 1914 he was made Vice President of the First National Bank. In 1927, he was elected President, and in 1932 he became Chairman of the Board, retaining this position until his death in 1943. Mr. Adams is remembered particularly for his civic involvements. The Portland Art Museum will be forever grateful to Mr. Adams for his interest, enthusiasm, and helpfulness. The final contribution of Mr. Adams to the Art Association was the bequest of his entire collection of paintings. His paintings were collected for the most part between 1913 and 1919 and consist mainly of French painters of the Barbizon group. delightful anecdotal comments about their childhood on Flanders Street. In 1918, according to information provided by Charles F. Adams, Jr., the house was remodeled to accommodate Mr. Adams' increasing needs as a collector. A first floor library was added behind the living room, creating a large, but cozy area on the first floor, a generous sized bedroom and bath on the second floor, and additional storage space on the third floor. A second floor sleeping porch on the north side was moved to the east side of the second floor. After the sale of the house in 1943, the external and internal appearance of the house was greatly affected by its adaptation as a convalescent center. Due to storm damage in the early 1960s, the roof and third floor space were eliminated and a flat roof was substituted. At about the same time the red brick was painted gray-green, and the garage on the east side was removed and replaced by a huge expanse of asphalt. For a period of fifteen years the building was barely recognizable as the once fashionable Adams dwelling. William Marcy Whidden and Ion Lewis, Architects, were boyhood friends in Boston and graduated from Massachusetts Institute of Technology in 1877. Whidden, born on February 10, 1857, continued his education at the Ecole des Beaux-Arts in Paris for four years and then began working for McKim, Mead and White in New York. Lewis, born on March 26, 1858, stayed in Boston to work for Peabody and Stearns. Whidden came to Portland in 1882 to represent Stanford White on the Portland Hotel project. Late in 1883, the hotel project fell through with the collapse of Henry Villard's financial empire. In 1888 the hotel project, under new owners, revived and Whidden returned to Portland to finish the project. the Ion Lewis Traveling Fellowship at the University of Oregon. Their firm nurtured the profession of architecture in Portland. One of their most famous employees was A. E. Doyle, who later designed the Multnomah County Library. In 1920 Whidden retired and later died on July 27, 1929. Lewis continued the firm until his death on August 29, 1933. Whidden was survived by his wife and two sons, Austin Chamberlin and Thomas Marvin; Lewis was a bachelor.